This was going to be a long day. 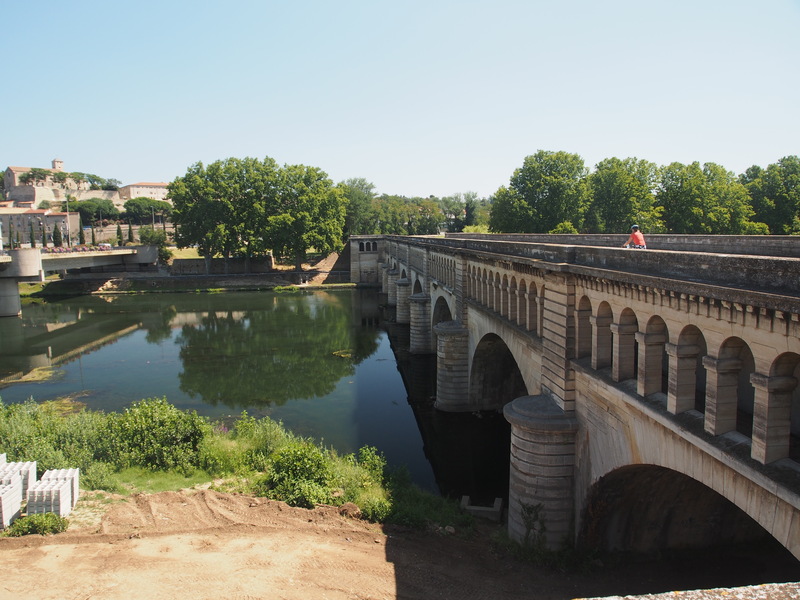 We did not want to stop in Beziers, a larger city, as we were going to be returning our bikes to Beziers at the end of our trip and we wanted to stay in a smaller place. So off we went prepared for a longer than normal riding day. The architecture of the canal is amazing. 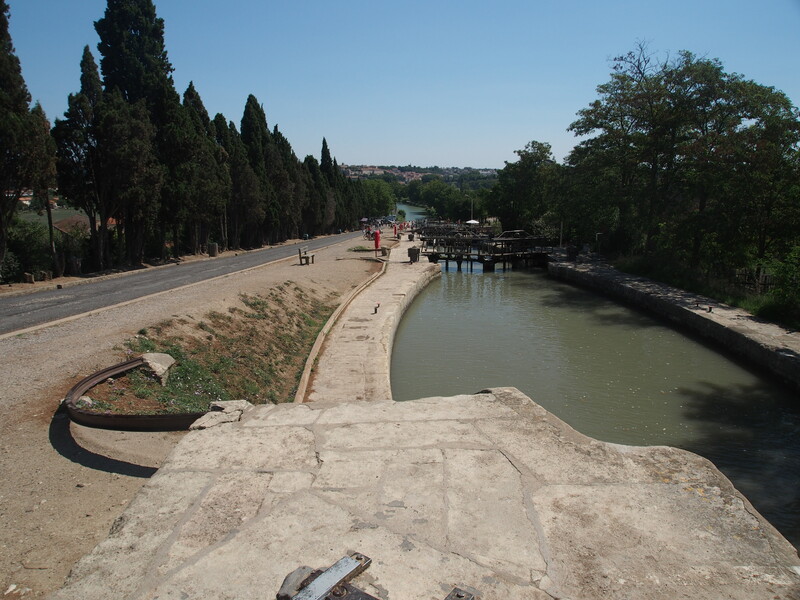 A lot of the water that supplies the canal comes from the Montagne Noir which is where Saissac is located. It always amazed me as we cycled along that this was built almost 400 years ago. Anyway we are glad to see that there is a Canal authority in existence that is doing its best to maintain the canal providing funds to local communities that want to do improvements in their section. The variety of condition varies greatly and is nothing like the trail along the Donau which is in magnificent condition. However, we were never deterred from using the path along the canal although at times it got a little rough. If we had been doing this in the rain it would have been a different story. Having said that about the trail here is an example of a slightly rougher section and all you have to do is add rain to this path and you can imagine what it would be like. As for the boat – well, some people either just tie their boats to the bank and leave them to rot or they’ve sprung a leak and end up as above. The other item to note here is the condition of the plane (platanus) trees. “Ceratocystis platani, a wilt disease, has become a significant problem in recent years in much of Europe” (Wikipedia). 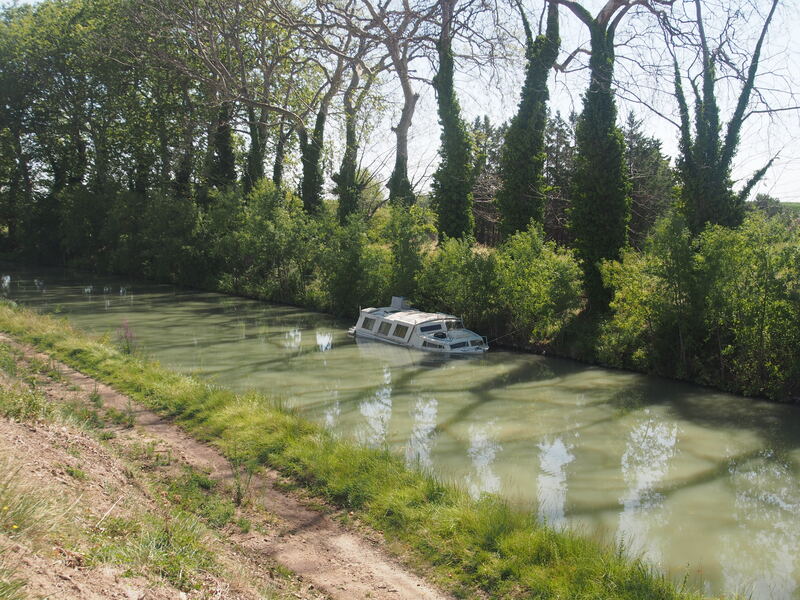 For the canal, and a lot of the roads, in France it’s a big problem. Who knows what they will be replaced with. They are great shade trees and for cycling along the canal provide relief from the relentless sun. Next stop was the Oppidium d’Ensurene. This was located on the route and included one of the few hills we had to climb. How easy can it get, eh? Well, it was my suggestion that we go up. And what a grind. After cycling 3 km almost straight up we got to the steepest point. We all started the last grind at the same time weaving all over the road to get to the top. We moved over when cars came by but to make it all the way up we needed to traverse the road to make it a little easier. At the top I was confronted by an irate driver who was in the parking lot who started to berate us for not staying on the right side of the road. I tried to explain, in my high school french, the difficulty of going up a slope like that without weaving. He wasn’t willing to listen and turned away in anger while the other young french couple listening shook their heads incredulously. I have to say this was the only negative incident in our whole cycle trip. The oppidium dates back to the Romans. Unfortunately it was not open when we got there. But the view from above across the plain was incredible. 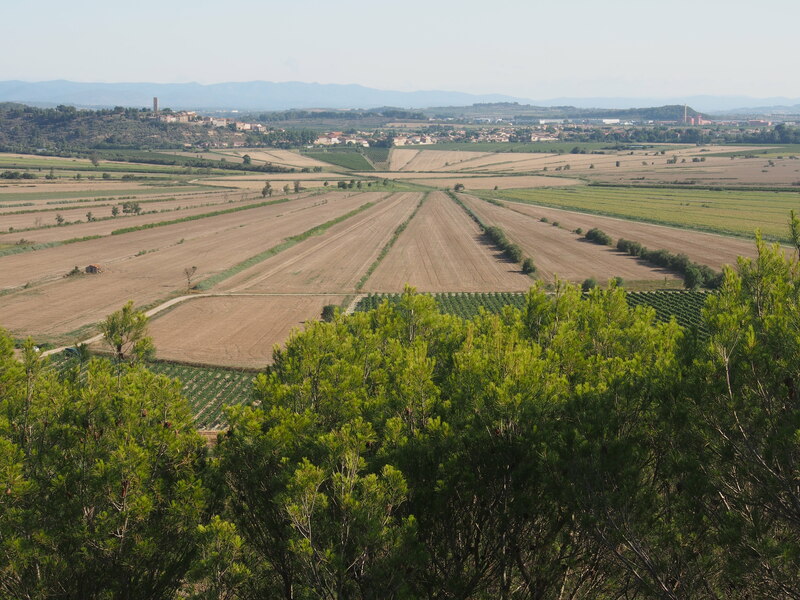 The picture above is taken from the Oppidium and overlooks the Etang of Montady which at one time was a salt lagoon which in 13thC was drained and turned to cultivation. I think this was my one regret from our cycle trip that we didn’t wait for the Oppidium to open allowing us to walk through the ruins and the museum. 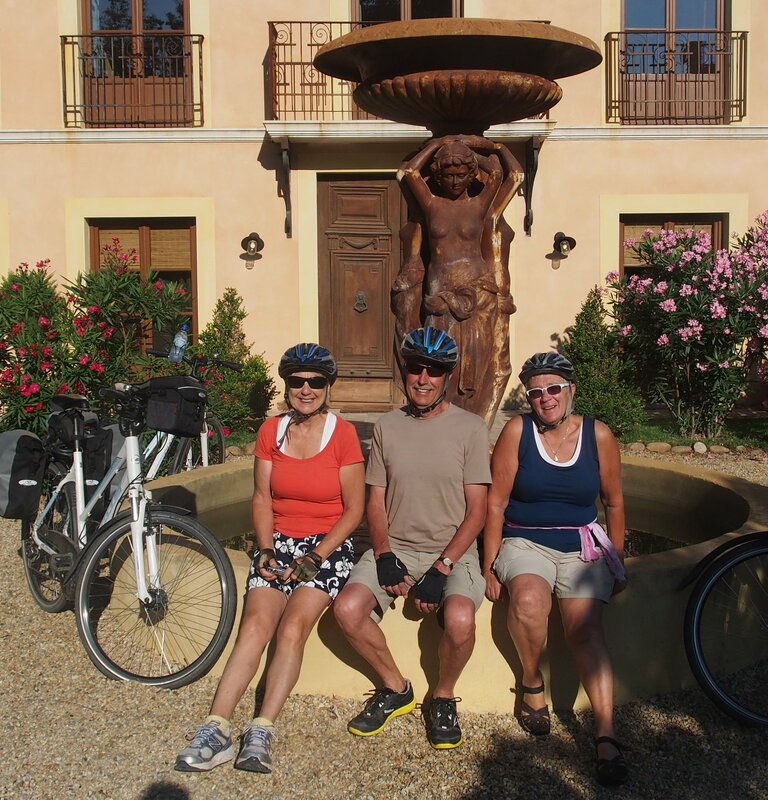 Perhaps we’ll return when we finish off cycling the Canal between Toulouse and Carcassonne. Had a great ride down the hill back to the canal to continue on. 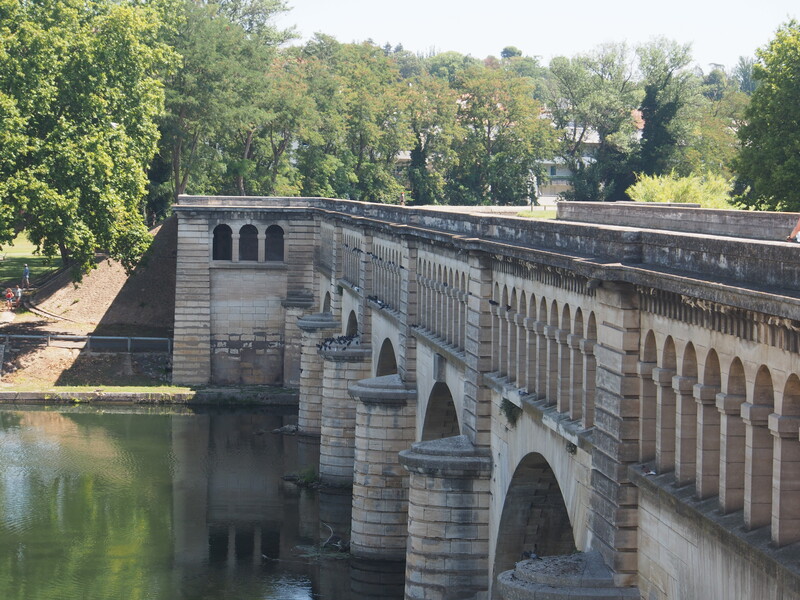 Our next challenge was to find our way around the city of Beziers. 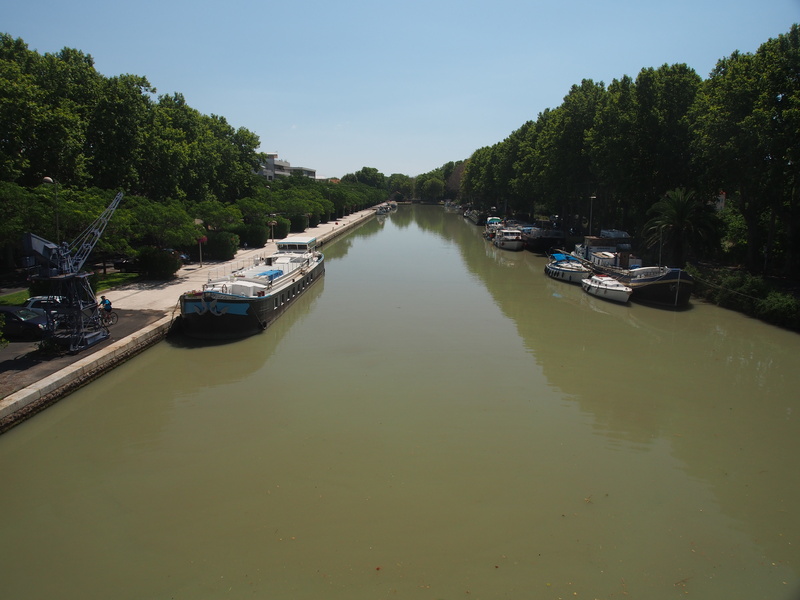 We finally make our way around Beziers and onwards to the Mediterranean coast. True to the book’s description even here the path is questionable. 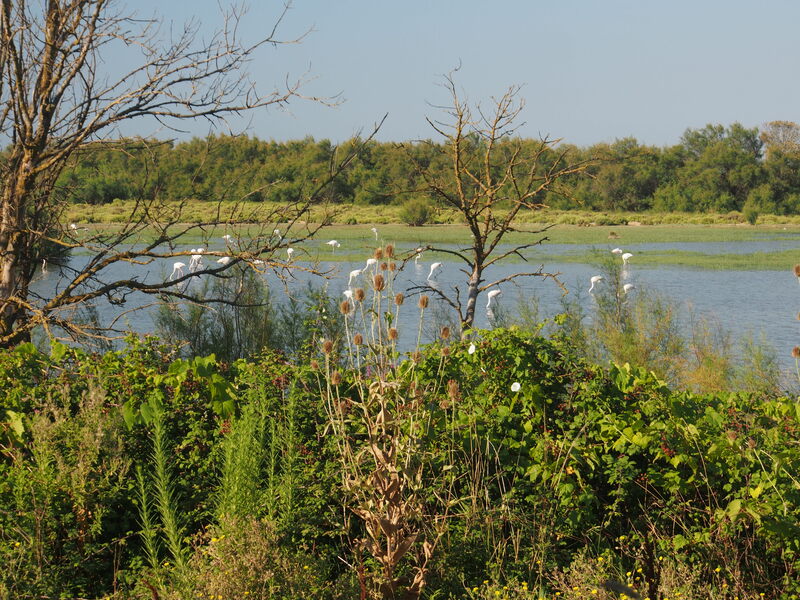 However, sighting of cranes on the low marshy areas boosts our spirits and makes the going pretty easy. We finally made it to our destination, Villeneuve les Beziers. Am afraid that I have no pictures from here and through the next day. I can’t remember if I took some and lost them or…. How do the boats get under that 12 arched bridge? it looks so low! Just got back from Cortes,it was a great week! 9 adults and 3 kids and we are still speaking. Got home to Connie’s paper post card from the paper mill. Many thanks Connie, you know I love these cards!